His tutorials feature open phone lines for students to text-in questions, flash mob dances to explain chaos theory, and YouTube videos discussing the history of sociology using SpongeBob Square Pants. 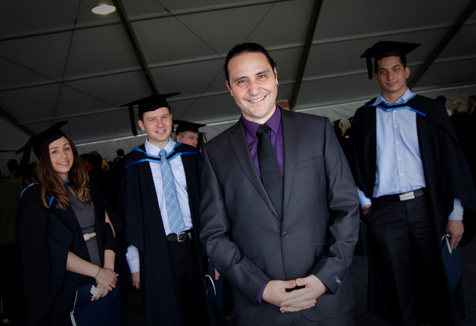 No wonder Professor James Arvanitakis from the University of Western Sydney has been named the Prime Minister's Australian University Teacher of the Year. At a special awards ceremony in Canberra last night, Professor Arvanitakis was recognised by the Australian Government Office of Learning and Teaching (OLT) as one of the nation’s most outstanding university teachers. It is the second consecutive year that a UWS academic has received the prestigious Prime Minister’s Award. In 2011, Professor Roy Tasker from the University’s School of Science and Health also took out the top prize of ‘Australian University Teacher of the Year’. The OLT Teaching Awards give recognition to teachers who are renowned for excellence in their fields; who have outstanding presentation skills; and who have made a broad and deep contribution to enhancing the quality of learning and teaching in higher education. Professor Arvanitakis, from the UWS School of Humanities and Communication Arts and the Institute for Culture and Society (ICS), attended the national ceremony to receive an OLT Award for Teaching Excellence in the ‘Humanities and the Arts’ category. To also walk away with the title of ‘University Teacher of the Year’ is an exceptional honour – one that is only bestowed on academics with an outstanding record of advancing student learning, educational leadership and scholarly contribution to teaching and learning. Formerly a merchant banker, Professor Arvanitakis pursued an academic career after witnessing child and indentured labour in third world countries. He has since completed a PhD, titled Hope and Abundance; written a text book commissioned by Oxford University Press; received invitations to teach all over the world; and developed programs to bring together students and non-government organisations in the promotion of active citizenship. He has also worked to develop sustainable, socially just and equitable economic policies with organisations such Oxfam, Aid/Watch and the Centre for Policy Development, where he is a research fellow. 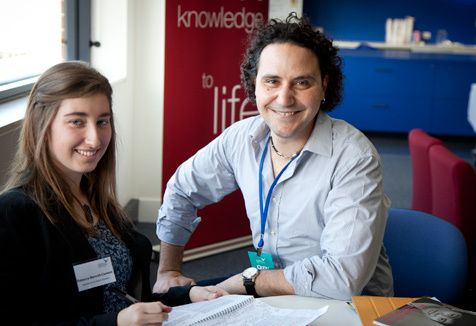 As part of his work with Oxfam, Professor Arvanitakis created Australia’s Young Engagement Unit to develop active citizenship program, The Couch. The success of his work in this area was reinforced when the Australian Research Council awarded a Discovery Grant to further his research. “The ARC Grant is very special to me, as I actively encourage students to see how they can have a positive impact on the world,” says Professor Arvanitakis. Over the last ten years,Professor Arvanitakis has dedicated his academic career to enhancing the student experience with innovative teaching methods. In accepting the prestigious Prime Minister’s Award, he has paid tribute to his students at the University of Western Sydney. “Every day when I come to work I get inspired by the most selfless and imaginative students,” he says. Former student Claire English says she was a bit daunted in her first semester of university, but taking part in Professor Arvanitakis’ lectures inspired her to do more. “I still remember hearing James’ lecture on global inequality. It really opened my eyes as to the way the world works and made me want to make a difference,” says Claire. Professor Arvanitakis’ success in the OLT Teaching Awards follows the news that eight of his academic colleagues at UWS have also been announced as winners of prestigious Office of Learning and Teaching Citations. Dr Brenda Dobia, School of Education: For leadership, innovation and excellence in designing curriculum resources that enhance student engagement and promote effective application of learning. Dr Tania Ferfolja, School of Education: For developing pre-service teachers’ understandings about diversity through community engaged learning in the region in which they are most likely to be teaching – Greater Western Sydney. Dr Gwyneth Howell, School of Humanities and Communication Arts: For the innovative and effective design and implementation of pedagogies that develop students’ understanding of crisis communication practice, fostering desired attributes in public relations graduates. Dr Lucie Ramjan, School of Nursing and Midwifery: For contextualising nursing concepts within the classroom: recreating the reality of clinical practice and inspiring nursing students to have a passion for learning. The Chinese Team Dr Xiaoying (Sheila) Qi, Dr Ruying Qi, Dr Guo Wu, Mr Lijiang Zhao, School of Humanities and Communication Arts: For sustained excellence as a team in teaching and developing innovative curricula and resources in Chinese language and culture to engage students of diverse backgrounds.